Prime Minister Benjamin Netanyahu on Wednesday dismissed claims he and Kadima chairman Shaul Mofaz have secret deals the public knows nothing about. "This was the only agreement that was signed," Netanyahu said, referring to the bombshell unity agreement with Kadima he dropped on Israel before dawn on Tuesday. Lawmakers were already voting on a bill proposed by Netanyahu's own Likud party that would dissolve the Knesset and set early elections for September 4. While Netanyahu never explicitly said there would be elections, he hinted that he supported the bill, and his close advisors had been telegraphing the bill for a week. Mofaz, however, had said he would never join the Likud-led government and said – despite plummeting poll numbers for Kadima – that he was ready for elections. 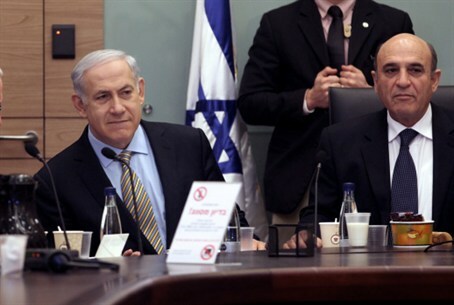 The shocking reversal has led opposition officials to charge Netanyahu and Mofaz have conspired on other matters, and demanded these be put up for a vote at the Knesset. However, with a 94-seat supermajority the Netanyahu government has effectively neutralized a deeply divided opposition, which includes leftist, nationalist, and Arab parties. Wednesday's session in the plenum was halted due to the vitriol the accusations were presented with.